Last week while we were both in Nashville, TN working on different projects, Ted Pattison and I sat down with Rob Foster for an interview for the popular SharePoint Pod Show... episode #17! In this interview Rob talked to us about different development techniques and tools... and just some random banter. 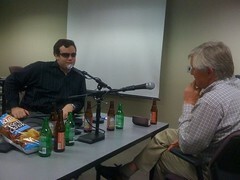 As you can see from the photo, it was a very intense interview... and it was just the start of a fun evening.